Disclosure: This post is sponsored by Kraft. I am being compensated to share my experiences with their product; all opinions are 100% my own. I adore salads and while I eat them just about every day, I rarely make the same salad twice. There are so many options when it comes to nutritious salads! In this post, I want to show you how you, too, can be creative with salads, and how you can make a salad substantial enough to be a meal. I also want to tell you about a new favorite salad that I “discovered” this summer. Next, add 1-2 cups of any combination of the following, chopped into bite-sized pieces, or any other raw or cooked vegetable that’s not on this list that you like (roasted vegetables are terrific in salads). *People’s protein needs do vary based on their size and activity level. I try to eat quite a lot of protein because I work out with weights and I am training for a competition right now, so I really load my salads with the high quality protein sources I mentioned above. I suggest becoming familiar with the amount of protein that you need each day: this will help you add the appropriate amount of protein to your salad. 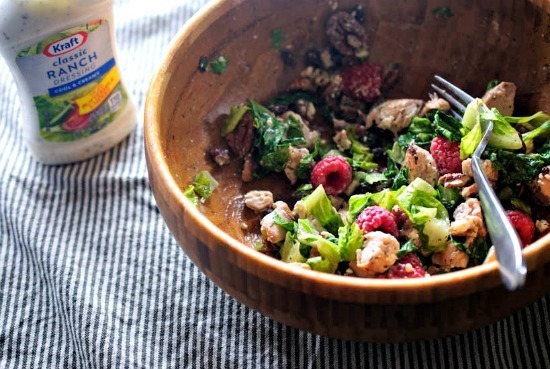 Dress the salad with 1 to 2 tablespoons of dressing per person. I generally use olive oil and some balsamic vinegar or lemon juice to dress my salads, but sometimes I prefer something different. In that case, I may venture into homemade creamy dressing land (I enjoy buttermilk and yogurt-based dressings). Or I may reach for one of the bottled dressings I keep in the refrigerator when I want to change things up in a pinch. Though I used to stay away from bottled dressings as a rule, this is something I have relaxed about lately because I enjoy some of them and they make up a very small part of my diet. 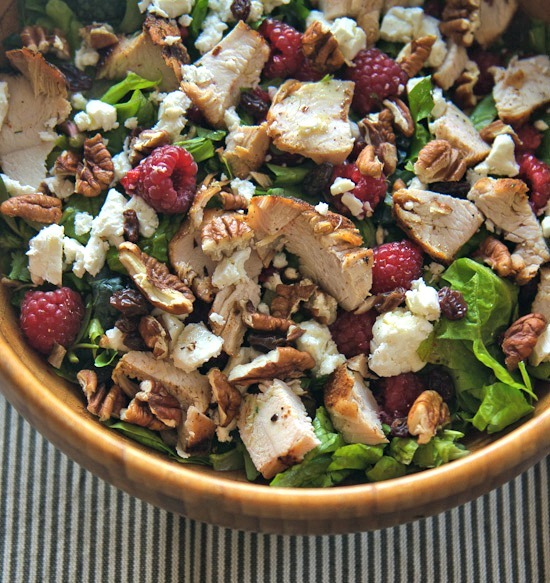 I made the grilled chickensalad you see in these photos with organic Romaine lettuce (2+ cups), 1/2 cup raspberries, 1/4 cup raisins, 1 chopped grilled chicken breast, 4 tablespoons crumbled feta cheese, and 4 tablespoons chopped raw pecans. I dressed it with 1 tablespoon olive oil and 1 tablespoon Kraft Classic Ranch Dressing. It was so tasty! A healthy food blogger promoting Kraft? Seriously? There is NOT ONE HEALTHY INGREDIENT in this product made by a company that actively tries supports hiding GMOs and cares nothing about the health of its consumers. I am SO disappointed in your decision to reduce your integrity as a healthy foods blogger to stoop to advertising this junk. I saw your comment on Facebook and responded there, but I’ll respond here, too. I make the decisions for my blog that feel right to me and I stand by this post just like I stand by everything I write. If it doesn’t sit right with you, that’s ok.
Maybe for someone else, though, it will free them up from thinking they have to eat absolutely perfectly to be healthy. I personally do not believe a tablespoon or two of bottled dressing is going to make or break your diet. Just like a cookie or two won’t, etc. Also: not everyone has access to 100% organic, GMO-free foods.